The Hot Spot Buzzer has an aim point that can trigger a strike. Hook : 16-10. Grub hook. Thread : Black UTC 140. Rib : Contrasting colour of thread. Thorax : Tag of DFM floss, orange, followed by peacock herl. Start the thread in the thorax area and run down round the bend of the hook in touching turns. Catch in a length of contrasting thread, then take the thread back to the start of the thorax area. Rib the abdomen with the second thread. Tie in the DFM floss and wind a small neat tag. Take the thread forward a little way and tie in the breathers. Trim off the butts of the breathers and take the thread back to the eye side of the tag. Tie in the peacock and wind forward to the eye, follow this with the thread to strengthen the peacock. Whip finish. 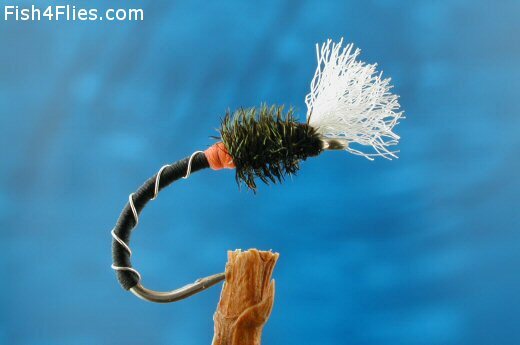 Currently there are no comments about the Hot Spot Buzzer fly pattern from other fly fishermen yet.